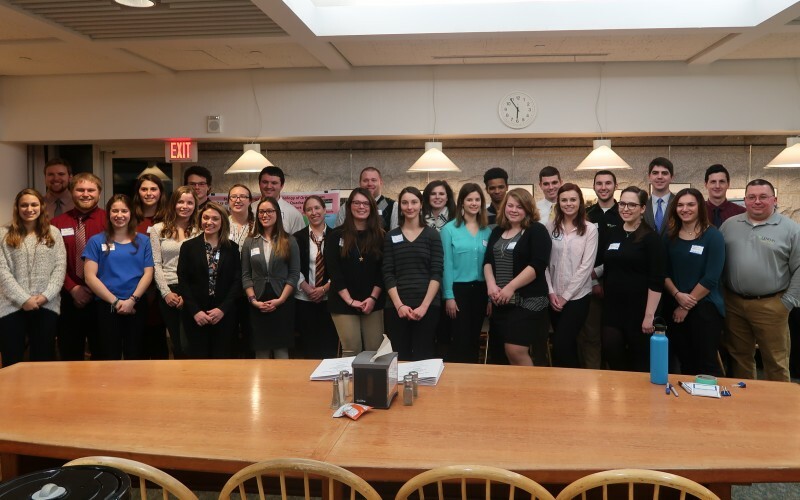 Putting their studies into action, Castleton students and faculty members recently traveled to the Vermont Statehouse in Montpelier to present their original research to Vermont legislators alongside other members of the Vermont State Colleges System (VSCS). The presentation, organized on-campus by professors Linda Olson and Jennifer Turchi, was part of a co-sponsored effort by the VSCS and the Vermont State Colleges Faculty Federation to showcase scholarly and community-service work produced by students. The evening highlighted the scientific work that students created side-by-side with their faculty mentors as a stepping stone into their future careers in the field. Castleton Biology student and Vice President of the Castleton Sustainability Club Angela Golding was one of the many students who presented, sharing her research on katydid microbiota and secondary metabolite tolerance. “I felt that our representatives simply hadn't seen how much can be accomplished in small universities like Castleton, and the academic symposium was a way of bringing to their attention how many young professionals, like me, seek to conduct research and pursue my love for science here in Vermont,” she said. Projects on display represented each of the five members of the VSCS with select faculty and students available on-site throughout the night to discuss their work.